The Thermalert XR combines high performance non-contact temperature measurement with industry standard four-wire technology locally configurable at the measurement head. The Raytek XR Sensors are designed for continuous temperature monitoring in a broad range of manufacturing processes. The XR is a rugged, NEMA 4 sealed single-piece system with the flexibility to handle nearly any application. Multiple extended temperature ranges, precision temperature resolution, RS-485 output and a flexible electronic platform create a single sensor that solves the most challenging application. 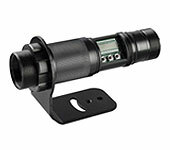 Optional laser sighting and high-resolution optics provides the solution for either small targets or long sight-tubes. An intuitive user interface reduces setup time and adds powerful trouble-shooting capabilities. Common and configurable installation hardware and software reduces installation expense and variation. The Raytek XR has a flexible user defined analog output, allowing this sensor to be installed with almost any existing control system. This unique capability sets a new standard for process monitoring. The Raytek XR sensor insures a consistent manufacturing process and allows tighter tolerances on heating processes, reducing heating costs. Accuracy ±1% of reading or ±1.4°C, whichever is greater @23°C±5°C.